Within easy reach of London, Oxford and Reading lies an impossibly romantic house and estate, Coombe Park – a faded beauty in need of a saviour. ‘A completely faded glory… a place that time forgot’. How could you not warm to a place immediately on hearing such a description? The property in question is Coombe Park at Whitchurch-on-Thames, Oxfordshire. This 125-acre estate on within its Repton landscape on the banks of the Thames is for sale at a guide price of £10m via Strutt & Parker (whose agent Mark McAndrew provided that enticing description) and Knight Frank. Created by James Gardiner, scion of a Bristol family, which derived its wealth from sugar and slavery, on his return from the East Indies in 1865, the heart of the estate was a grand, 18th-century mansion, the main part of which was demolished after the Second World War, with the former servants’ wing and coach house adapted to form the principal estate residence. This was extended and refurbished in 1982 to create the still imposing, 13,368sq ft main house, which is now said to be ‘in poor order’, having remained unoccupied for more than four years; it has four main reception rooms, six bedrooms, five bathrooms and an indoor swimming pool. Yet while work is needed, the grandeur is clear to see. From the romantic gates which guard the property’s entrance to the beautiful ceilings and parquet floor in the ballroom to the sweeping staircase in the main hallway, this is a house with all manner of fine touches which just need the right hand to bring them back to their best. Reflecting Coombe Park’s ownership by the Howard family of racehorse owners and breeders from 1898 until after the Second World War, which saw the estate expand to 670 acres in 1920, is a complex of period stud buildings, cottages and offices, and a range of 10 stables and outbuildings, together with a large traditional brick barn. 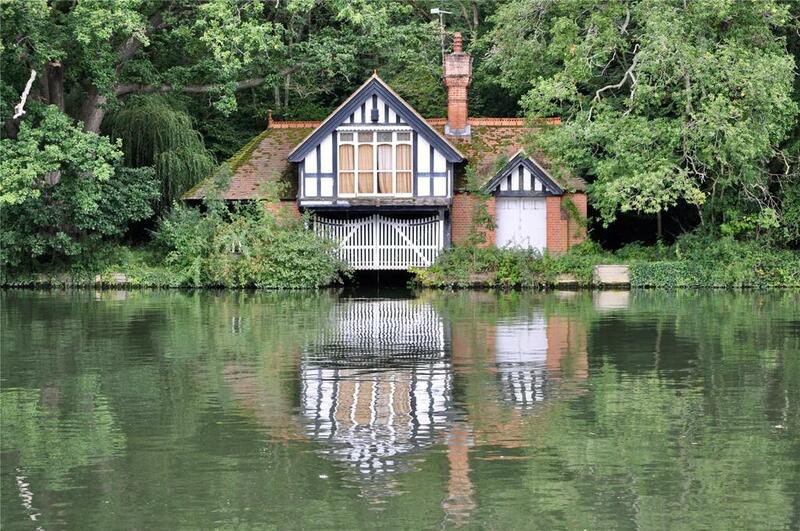 Shades of Edwardian splendour are evoked by the picturesque brick-and-tile boathouse on the leafy banks overhanging the Thames. Even at this chilly time of year it’s almost impossible not to imagine yourself enjoying warm summer’s evenings down by the water’s edge. Coombe Park is for sale at a guide price of £10m via Strutt & Parker and Knight Frank – see more details and pictures.